Please check out my updated page for Skye Callahan’s Blog Tour for the release of her book, Fractured Legacy! Remember she is holding a scavenger hunt and on this page you will find my assigned clue word! Tour runs October 14-25 and the book is available for sale on October 22, 2013. Also note that November is National Novel Writing Month and this site is awesome! You must check it out. Free of course! Check out the forums. They even help you with ideas, thoughts and more. 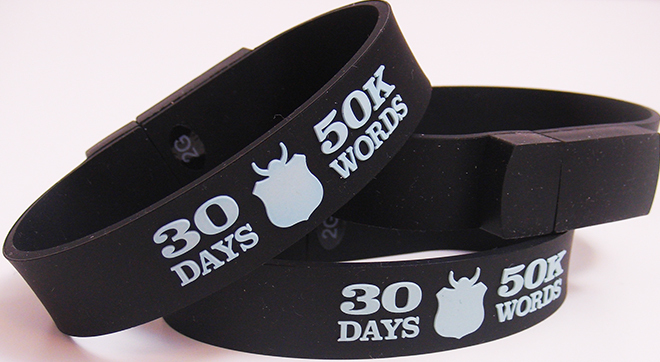 I love the bracelet that also doubles as a USB space to save your writings. Can’t lose it if you’re wearing it! We have enough things to search for in life—aliens, Atlantis, car keys—so why let your thumb-drive be one of them? Keep your novel close at hand with the new USB bracelet, outfitted with 2 GB of storage space to contain even the longest epics. Now you can spend your time searching for more important things, like a name for your main character’s uncle-in-law. Previous: http://nanowrimo.org/how-it-works November is National Novel Writing Month! Next: My son’s tenth birthday, grab some free books most need reviews too!